Soon after Philadelphia's Yellow Fever epidemic of 1793 subsided, accusations began against the black citizens who had worked so hard to save the sick and dying. Mathew Carey, who had fled the city when the disease hit, led the attack. 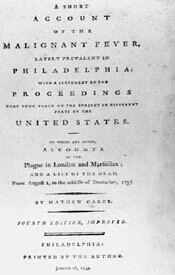 In a widely distributed pamphlet (dated November 14, 1793), Carey accused the black community of profiteering from the disease, and of plundering the houses of the sick. Allen, Jones and Gray, he stated, acted nobly, but many of the other blacks had not. Carey's pamphlet was extremely successful; by the time Richard Allen and Absalom Jones published a response ("A Narrative of the Proceedings of the Black People..."), Carey had already published a fourth edition.